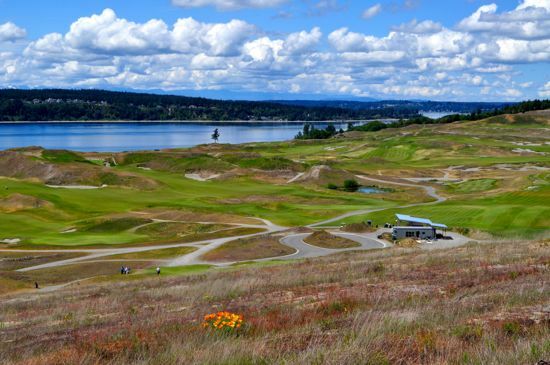 Chambers Bay is located in University Park Washington (about 15 minutes from Tacoma and 45 minutes from Seattle) and is a links-style municipal golf course that was first opened for play in 2007. 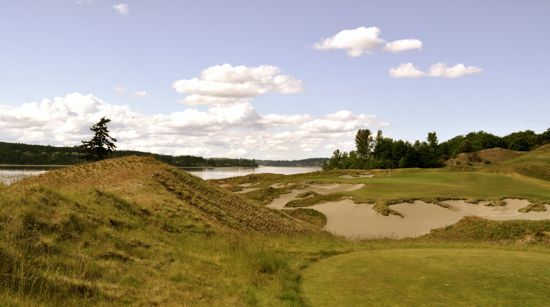 The site hosted the 2010 US Amateur and is the future site of the 2015 US Open. 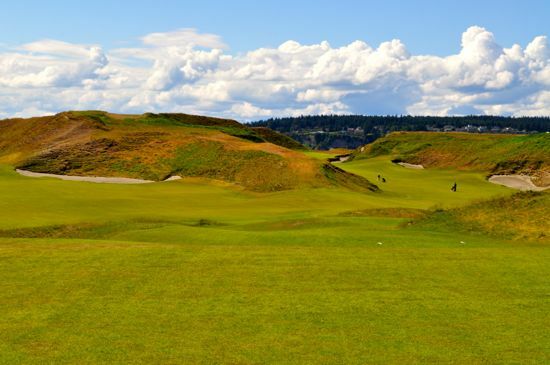 Chambers Bay was designed by Robert Trent Jones Jr. and is currently ranked as the #25 golf course in the Golf Digest 100 greatest public courses list. 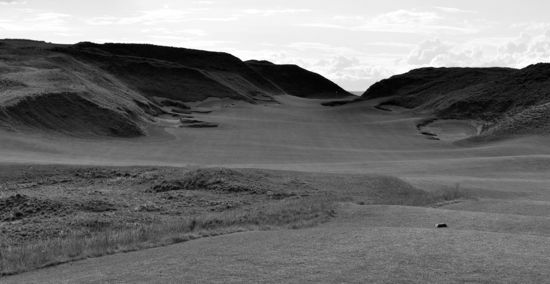 While the rankings and future US Open site characteristics of the course are impressive, it was the walking-only policy (complete with optional caddies) and the fast-and-firm fescue surface that really piqued my interest in the course. What I found was an amazing golf course that was a nice challenge to play and a great experience to remember. The view of the course from the clubhouse (located a short shuttle ride from the starting location) gives the immediate impression that this is not your ordinary golf course. The view of Puget Sound with the Olympic Mountains as the backdrop give the immediate impression that this is going to be a fun course and a great walk. 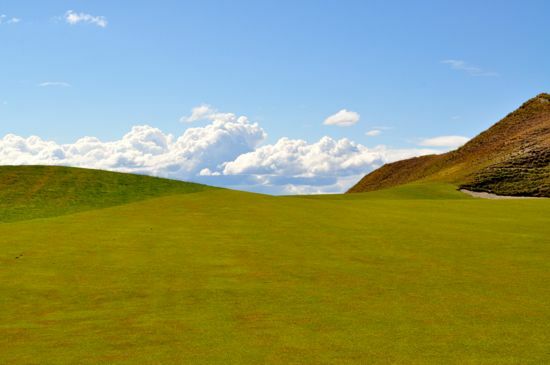 I played the course on a Thursday evening and it was apparent that Chambers Bay is a course that gets plenty of traffic. Finding a tee time on short notice was doable, but certainly not easy. 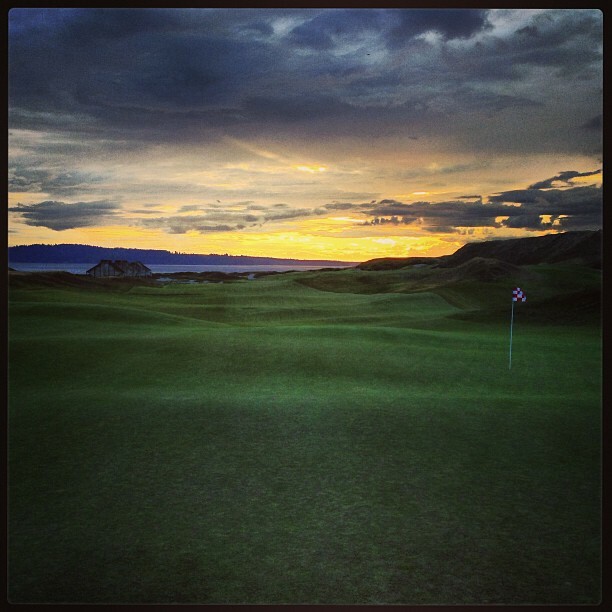 If you’re playing the course at any peak time, you’ll be best off to reserve a tee time with plenty of notice. The weather for my round couldn’t have been any better. I had bluebird skies for the front 9 with a storm that passed about a quarter mile from the course on the back. I was lucky enough to have the storm spare me from the rain while offering a beautiful setting from every hole on the last half of my round. One of the immediate and pleasant surprises was the fast and firm nature of the grasses throughout the course. 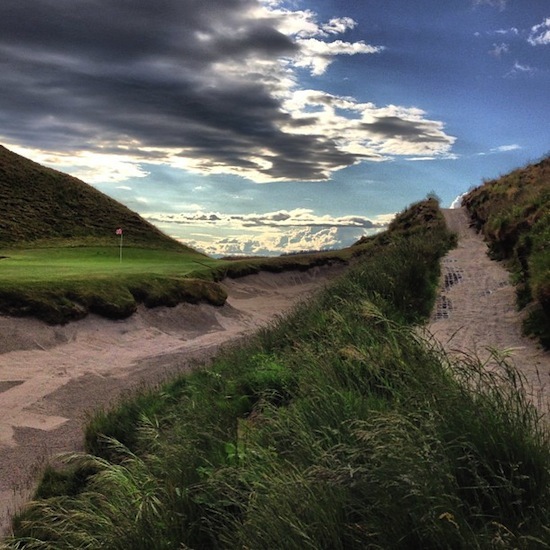 If you haven’t played on fescue then you’re simply missing out – the surface provides the links feel and was a great departure from the typical courses that I’ve become accustomed to playing on. 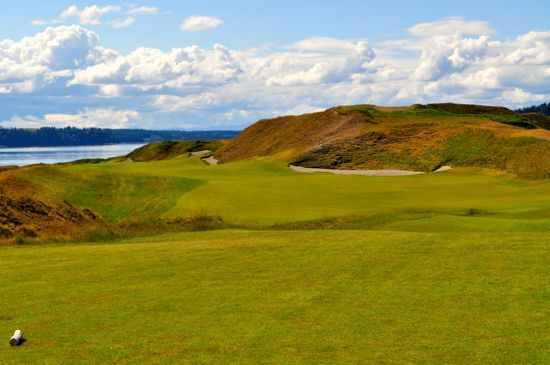 Chambers Bay has an excellent routing and challenging layout that will test many shots that you likely haven’t had to rely on very often if you play the majority of your golf in the US. With a steady breeze on the course and very little protection from the elements – the ground game comes into play almost immediately. On the day of my visit I quickly found out that you should watch your ball until it comes to a complete stop – if you don’t it’s likely that it will be 30 or 40 yards from you would expect to find it on a normal course. 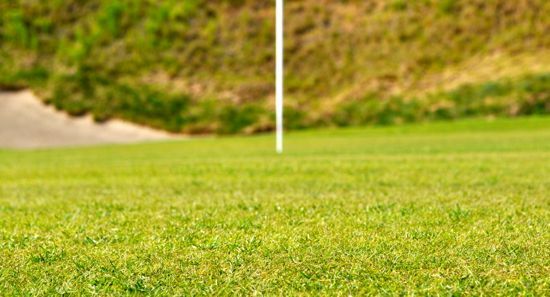 With the edges of the green almost unnoticeable from the fairway – you’ll likely be faced with many choices of whether to putt or pitch it to the pin. This is such a departure from typical country-club golf that you’ll be left pondering the plusses and minuses of any shot when you get into striking distance of the pin. 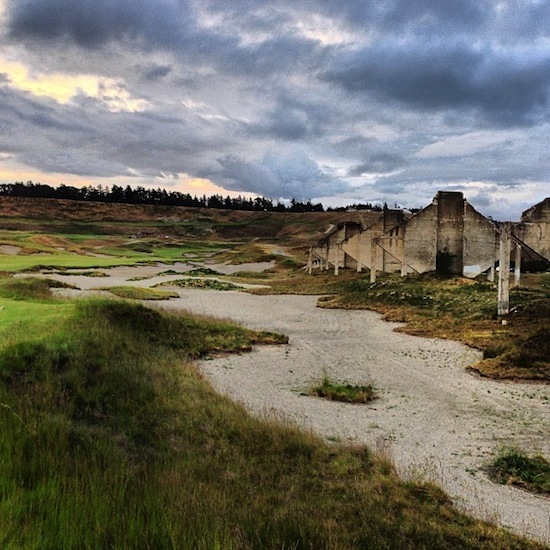 The walk through Chambers Bay isn’t an easy stroll, but it’s certainly a walkable golf course. The course is routed over a seven mile stretch with some areas that have significant elevation changes. 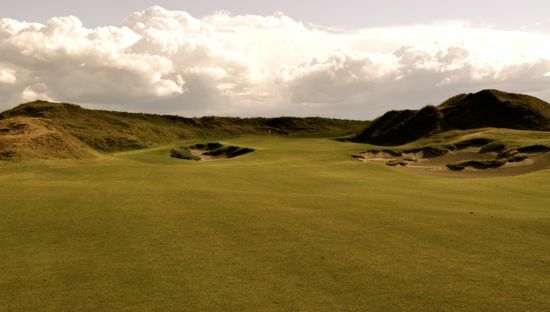 I love the lack of cart paths and having the venue as a walking-only course is a laudable decision that has significantly added to the links-feel and overall experience of the course. 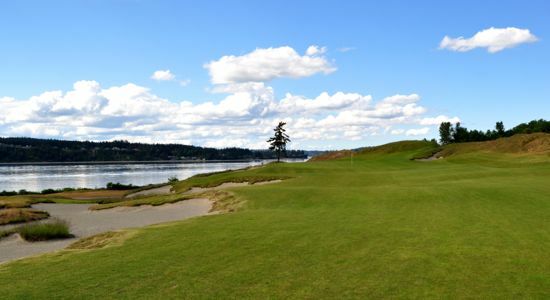 If I were to give a score to the Chamber’s Bay experience, the lack of cart paths would be a multiplier to the score rather than an additive contributor – it makes a huge difference. 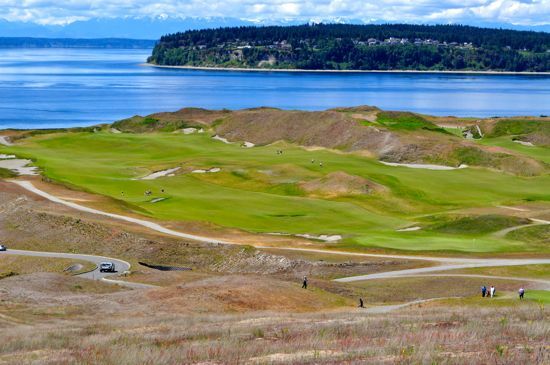 Chambers Bay is a clear “must play” if you’re anywhere near the Seattle or Tacoma area in Washington and is a track that I have a feeling that I’ll make the cross-country journey to experience again. 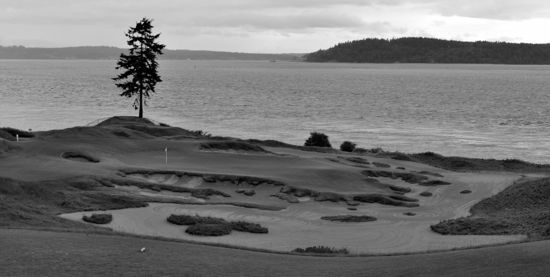 In addition to the photos on this review, there are many more pictures (and the high resolution versions) posted in the Fresh Chamber’s Bay Photo Album. I wonder if they have problems with old car tires or other household rubbish surfacing during the wet season. Obviously this course is an old landfill with flags! My course is green, the greens are fast. And we are into the second week of 90+ degree heat, with no relief in sight.